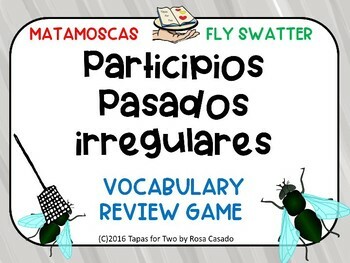 This is a NO prep and highly engaging game for students to review pretty much anything. 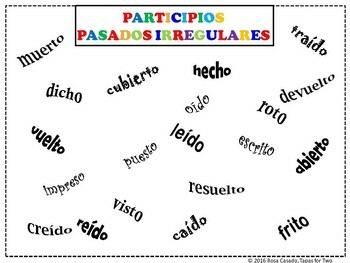 This one in particular will help your students review Irregular past participles in Spanish while having lots of fun! * The teacher reads a sentence from the calling card. * The students look for the answer and "swat" the word. * Repeat through all sentences in the calling card. * The team with the most points wins. I have included two versions! 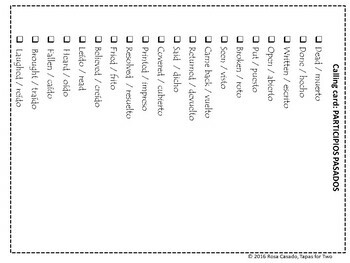 Use the version in Spanish and call out the past participles in English, or vice versa, use it in English and call them out in Spanish!